On Veterans Day I was on a 'rant' to honor the Military ~ a necessary part of our Country. Behaving like an over Zealous woman, perhaps. ~ for Alphabe Thursday. 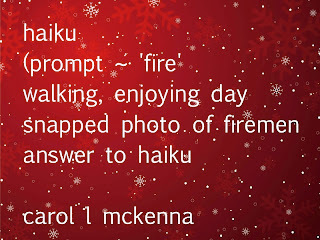 Irony of the Universe ~ Carpe Diem prompt for haiku was 'fire'. Out taking daily walk with ArtMuseDog and firemen showed up practicing their 'ladder work'. Thus the haiku above. Hope you have enjoyed our photography, haiku and pen and ink and watercolor painting and will check out the creative bloggers listed above ~ Wonderful 'eye candy'. The flag and flower vase drawing/painting is so sweet. God bless our military! What a terrific post! Great photography, love your beach shots. Lovely haiku as always, and a really nice painting! Love your photos and the ocean rocks and rills. Great Tonka rural photo too. The gull looks beautiful !!! Rocks can tell histories especially if they contain fossils.Brilliant photos.Thanks! I love the look of the rocks in the water. I enjoy your posts. Again a wonderful post Carol. Love the paintings and pictures. 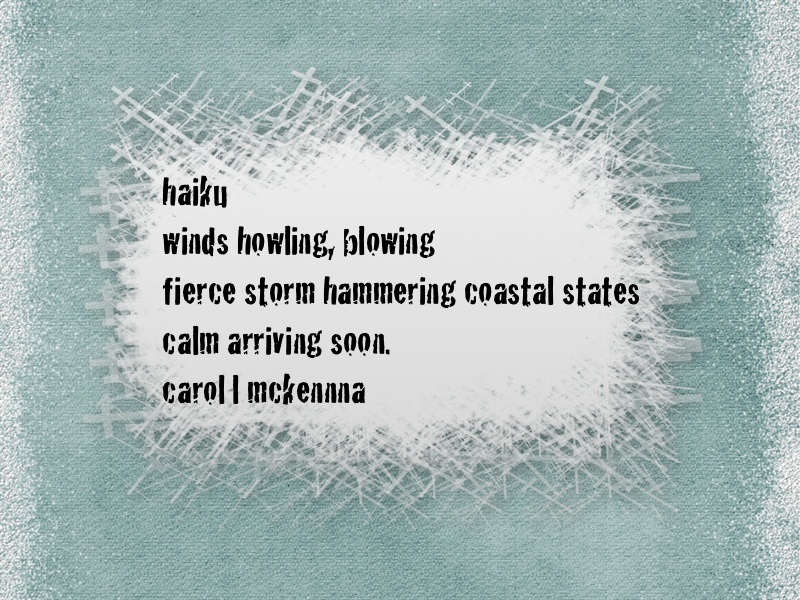 Your haiku are lovely especially the one written for Carpe Diem (smiles). Very well done on Still Life. Thank you for your every day contributions to Carpe Diem. A wonderful outdoor presentation. I really like the one with lonely gull. I appreciate so much your visiting and leaving a comment. Most of alI am very pleased you became a follower. So many layers to this post, it's hard to fathom how much you create on a daily basis, and how active your mind is. Truly lovely photos and loved the Tonka Truck. Beautiful shots, just love them. Did you just happen upon that Tonka truck or did you bring it with you? I love this so much... and your haiku, naturally & as usual, speak to my heard! Another fantastic AEDM2012 post from you! 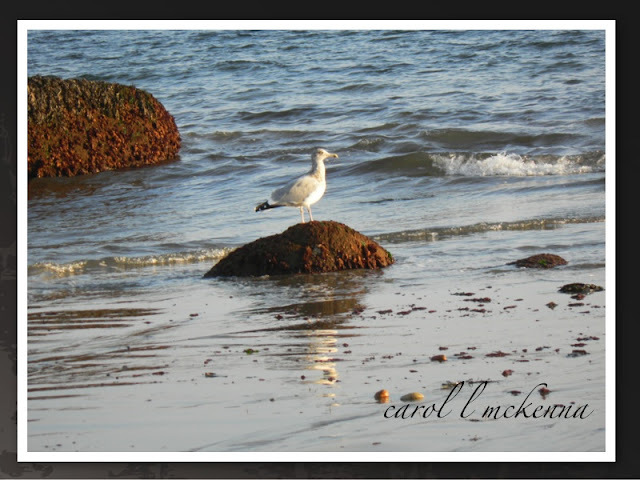 Thanks a lot for sharing these beautiful photographs, Carol. I like rocks by the sea and gulls. The two haiku about the rage of Nature are powerful. I loved the poetry attached to the photos and the Veteran's Day art was very nice. Nice photos. The final one is my fave. I just love the blue background; the drawing is also my kind of drawing. Very pretty. All themes in one, very pratical ! I came to admire your rocks ! The calm is good when it arrives. Carol, your photographs, haikus and painting are fabulous... so much goodness here. I so much loved your haikus ! I think you got a great presentation style here ! See you more often ! Lovely pics, Carol! Have a great rest of the week! 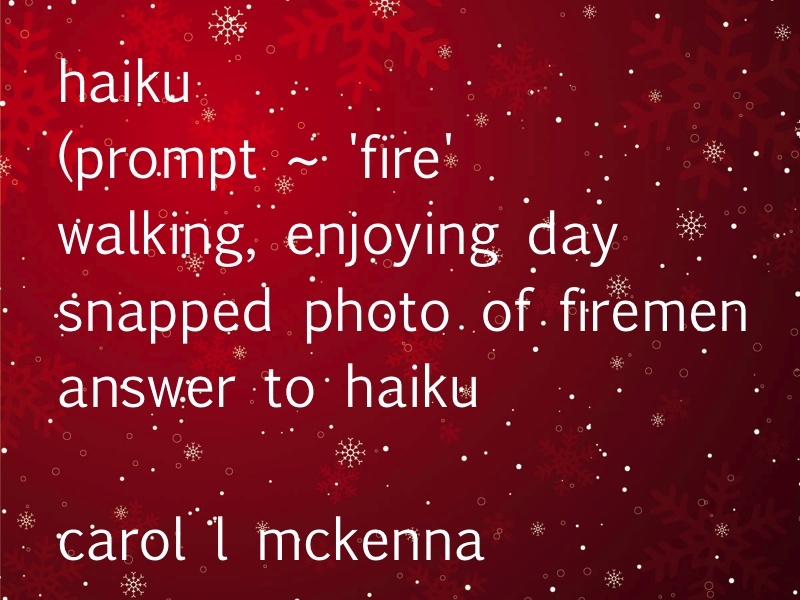 Nice haiku on fire Carol. Thank you for sharing. Everything here is lovely!! I couldn't help but to notice the Indian on the side of this blog, Man belongs to the Earth, Earth does not belong to man," and the little dog! Reminds me of dearly departed Muffillia! (Muffy for short) There's a little bit of everything here!! WOW! Your photos reminds me of home. Nice shots! Mr. Gull looks like he is waiting for a fish to swim by. Love rocky beaches. Always great photos. I like your positive attitude. You are so sure that in the midst of the fierce storm calm will arrive soon! So many poems come to my mind when I am out walking. 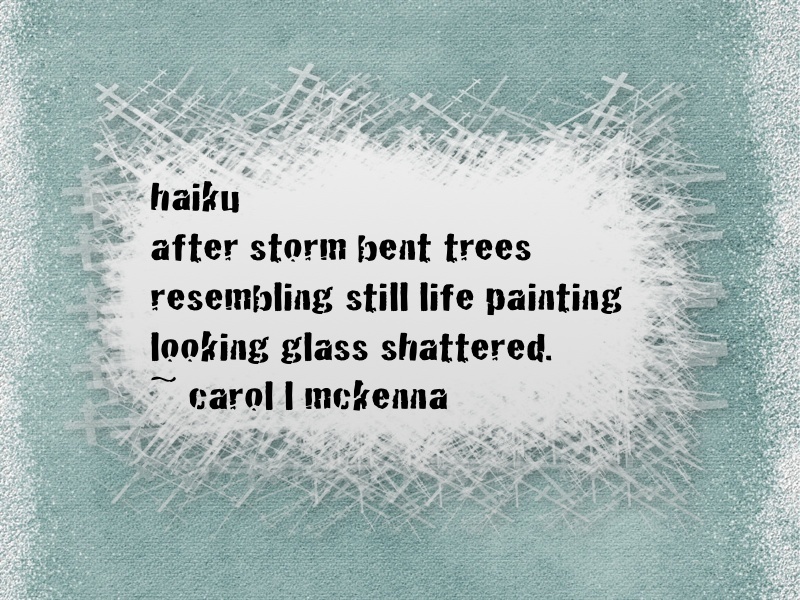 I love your photos and haiku too! I'm new at this and not sure my comment went through so here it is again. I too get inspiration for poems when out walking. I love your photos and haiku. Howling winds scare me. I know then that the storm it goes with is usually fierce. Everything here is wonderful! Your photos are beautiful and loved the haiku! Great pics! I had to look up where Cape Ann is, you're a couple hours north of us--we just moved to New Bedford from PA and loving living by the water!! 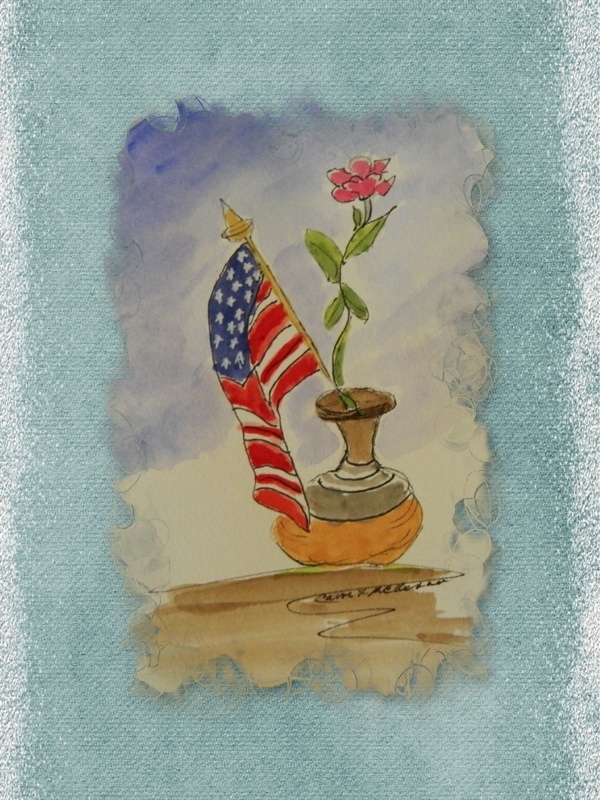 Enjoyed your haikus and your flag painting--nice!! The dump truck made me smile - my boys so love driving big trucks on the beach. Beautiful shots! Great post! LOVE the gull shots and your artwork with the flag!! Carol, I was viewing your lovely images and I thought, "I wonder how far we live from each other?" I think you are on one side of the coast and I am on the other?" The Tonka truck really spoke to me. Little man is coming next week and I think this would be great to have for him! Great inspiring images - as always! Beautiful photos - and the tanka trucks too cute! 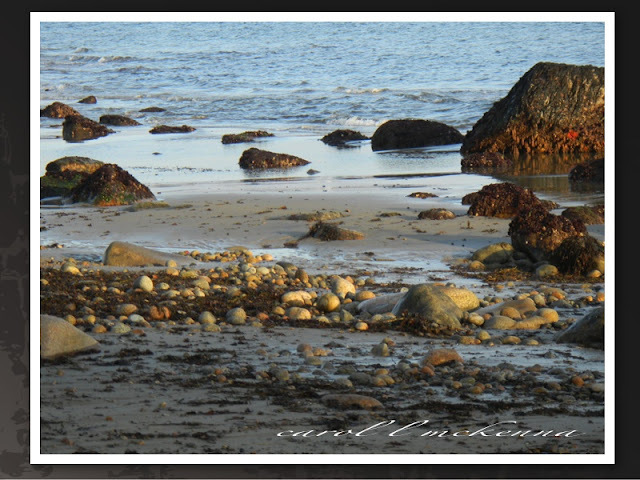 Beautiful beach rock photo's. When I saw the first picture it looked so much like my home I knew you must be very close by. I am on the north shore of MA. and you are just across the water away in cape ann. I am hoping that the storms we had recently are not indicative of weather to come. Wonderful post today! I loved that first Haiku and Mr. Gull! Your photos make me miss the ocean - don't see much of it living in Montana! Thanks for sharing. I love the shot of Mr. Gull! Carol, what a wonderful post. I so enjoy my visits here ... so much to entertain and delight the senses!! Thank you for putting so much energy is achieving all the prompts. Your selections flow seamlessly!! Great photos, as always! 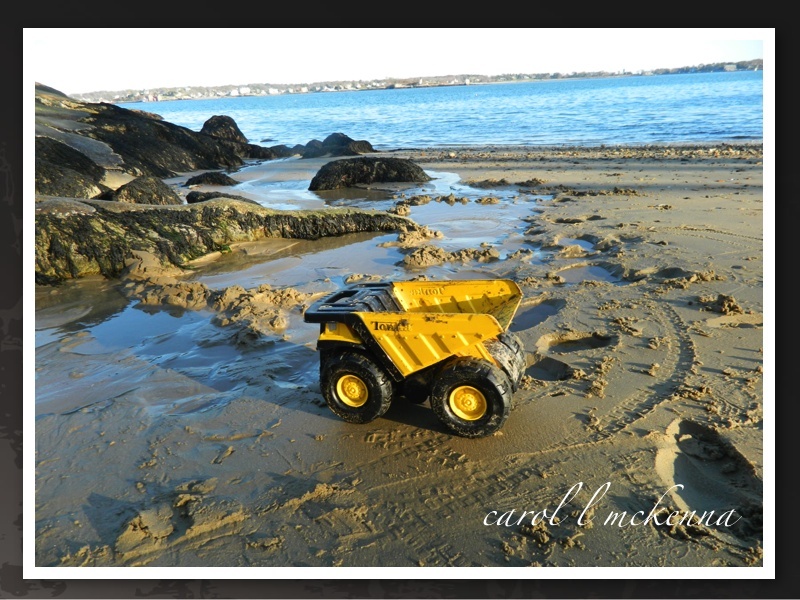 I think I like the shot of the Tonka truck on the beach. I gotta know, did you stage this or happen up on it? I mean, I'm never quite so lucky as that. I loved that you were zealous in remember our veterans. I like how your words are mingled together to form such interesting little lines of poetry. Thanks for the visit, my friend! Oh yeah, did Sandy affect you much? That was definitely a fierce storm! Hope everyone has there power on in NJ and NY by now. Loved reading your post! Wonderful photos! Beautiful, Carol. There is a wonderful spirit about this blog. 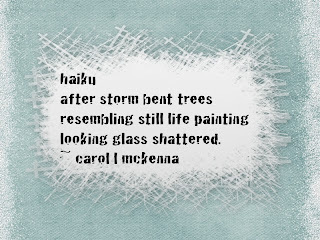 Loved the photos and haiku but hope your looking glass didn't really shatter. Just imagery. Right? I love the one with the Tonka truck! I love your beach scenes, very pretty! The truck looks like a great toy for playing on the beach some little one was having fun! Great shots, have a lovely weekend! 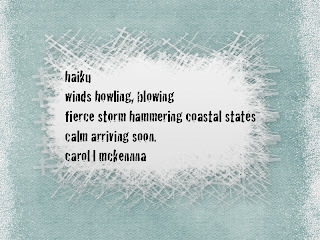 love those images and haiku! so sad for so many still out of their homes! Beautiful photos, as always! I especially love the gull on the rock. You're so lucky to have this gorgeous scenery at your back door. Nice haiku to go with these photos. And I was speaking up for veterans recently myself. So good on ya! A very original take on the prompt, Carol, well done! Oh I do love those beautiful beach pictures!! Wish I lived near a beach- just love the sound of the water- so relaxing! I love your little watercolor! And that beach looks glorious! Thanks for zis cute link to the letter Z.